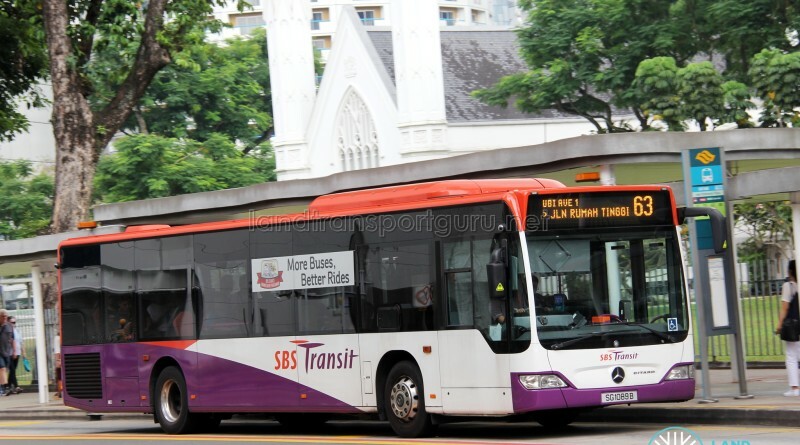 SBS Transit Bus Service 63 is a trunk route running from Eunos Interchange and looping at Rumah Tinggi Terminal, passing through Ubi Avenue 1, MacPherson Estate, Kallang, Bugis, Chinatown, Tiong Bahru and Lengkok Bahru. Although designated as a loop service, it operates identical to a bidirectional trunk service, including a short layover at Ruman Tinggi Ter. A shorter variant, Service 63M, also operates. 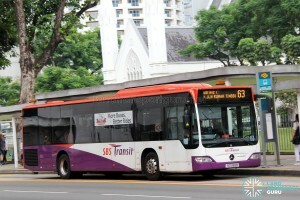 Service 63 is a trunk route connecting the residential estates of Kampong Ubi, MacPherson, Tiong Bahru and Bukit Timah to the central areas of Bugis, Clarke Quay and Chinatown. It is an important route between the Ubi Industrial Estate and Eunos MRT for many workers, and it also connects Rumah Tinggi and its surrounding Redhill estates with connections to Tiong Bahru MRT station. With few services serving the Rumah Tinggi estate, this service links the estate to Tiong Bahru MRT. Also, demand between Ubi Industrial Estate and Eunos MRT is high during peak hours, and Service 63M helps to relieve some of that loading. Double-decker buses are not deployed due to possible route limitations at Ubi and Rumah Tinggi. Although Service 63 is listed as a loop route, it unofficially terminates at Rumah Tinggi Terminal. Formally a proper terminal, it has been downgraded to a looping point with parking spaces for two buses. Bus drivers do not end their trip there; they take a short break before continuing off. Passengers are told to alight and re-board the bus after the driver’s break. Service 63 at a glance. Click for larger image. Affected Bus Services (40, 63, 63M, 65, 135, 154, 155, 158) due to reopening of Bus Stops along Circuit Link from 16 Oct 2016. 2002: Integrated with Service 382 and extended to Eunos Int via Ubi Ave 1. Also, amended to start from Eunos Int instead of Rumah Tinggi Ter. 2016 (16 Oct): Reinstated to ply Circuit Link instead of Lor Bengkok. 2002: Amended to present routing. No significant route changes since 2004. 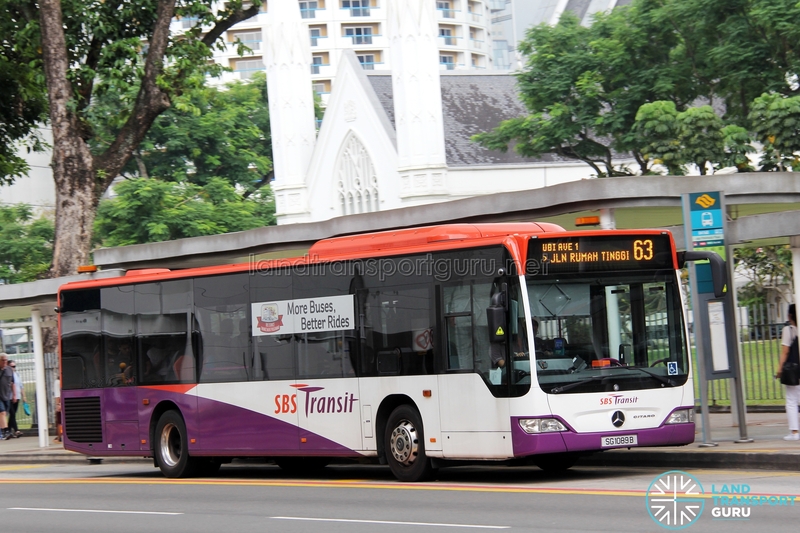 SBS Transit Svc 137 passing ubi ave 1 have volvo b9tl means svc 63 also can have volvo b9tl. 137 does not operate on double-decker buses. 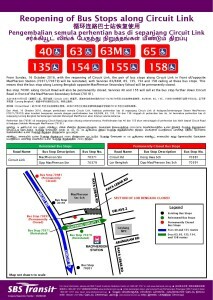 63 should be amended and extended to Bukit Merah Bus Interchange. A new feeder service from Bukit Merah can be introduced to loop at Rumah Tinggi. Yep , i agree with you.